Add wellness to your Pasta! Here is a reader to the Pasta lovers. You don’t have to resist that favourite Italian preparation of yours anymore just for a whole lot of junk ingredients that go into it. Pasta can be turned around into a healthy and tasty option in a few simple ways. Buy fresh ingredients of good quality and reliable brands and always check food labels for manufacture and expiry dates. The best change is to opt for whole wheat macaroni rather than the usual maida-based ones. Multi-grain, soya- based, millet-based, etc. are other variants also available. Select shapes like bows, twisters or spaghetti as shells, rings and penne may need a lot more sauce and cheese that fills into the inner surface of the pasta shapes. Need oil to prevent the macaroni from sticking together? Use olive oil and you will add to your pasta, the goodness of the many essential fatty acids it contains. You don’t need those ready sauce bottles anymore. These are loaded with salt, sugar, synthetic flavour enhancers and preservatives. Create your own to avoid these unhealthy ingredients. For white sauce you don’t need to use maida. You can just add 2 table spoons of wheat flour in cold milk (use skimmed milk to cut down on the fat), mix well and heat with constant stirring until you achieve the desired consistency. If you need fewer calories, go for the red sauce since you will have lots of tomatoes instead of milk. Don’t forget the troop of vegetables! Go for olives, zucchini, gherkins, coloured bell peppers, broccoli, basil, spinach…so many more. Go for freshly chopped vegetables rather than canned, dehydrated or previously pre-prepared ones to draw the best of nutrients. Keep the corn out, so that you keep some starch out as well. Use olive, soya or rice bran oil to sauté your vegetables instead of butter. Butter is much higher in saturated fat and loaded with salt. You can do without cream, when you have so many spices and sauces to please your taste buds. If you still miss it, add a teaspoon of the dairy creamer instead. A better option is to add home prepared soft - crumbled paneer. Cheese lovers can try adding a teaspoon of cheese spread to the sauces instead of pouring grated cheese liberally. If you need the cheese look, maybe you can add grated paneer on the top and then bake your pasta dish. Baking is a good cooking method to preserve most of your nutrients and save up on fuel. Toast multigrain bread in garlic oil lightly to substitute the garlic bread you need as an accompaniment. Even better, toast it with no oil or ghee at all. Have your pasta immediately. No matter what food, storing and reheating are both reasons for your nutrients to deplete. 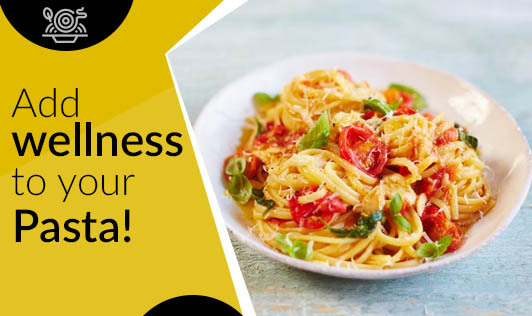 Follow these tips and you can easily classify your pasta dish as healthy and not junk food!